Westerbeke has managed to incorporate over 65 master distributors and their dealers worldwide to assist in the service of their quality products. Our Westerbeke dealers are dedicated to the consistent evolution of our product line as well as making sure that every customer is taken care of in the most efficient way possible. Whether it's parts, warranty, or technical service, you will always find a Westerbeke representative close by who can help. With over 70 years experience with marine diesel engines and a support network that's unmatched, it's easy to see why Westerbeke is still the prevailing leader in marine diesel and gas engines. Exclusively designed for marine applications, these engines represent a breakthrough in compactness, quietness, and reliability. Backed by a five-year limited warranty and used by the most prestigious auxiliary sailboat builders, thousands of engines have been installed in boats for pleasure, commercial and government use. Choose from several Westerbeke diesel models plus several Universal diesel models ranging from 12 to 66 HP. 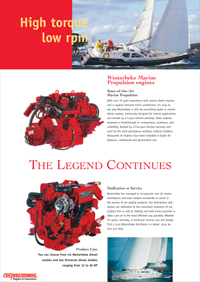 For complete details on the entire line of diesel and gas marine engines available through R.G. Grove and our dealer network, please download our PDF brochure.